This article contains an update. Congress is currently negotiating a Farm Bill in which the main sticking point is how much to cut nutrition assistance for struggling families. As lawmakers debate how much food aid to cut, however, a new report released today on poverty and hardship should give them pause. Released by the U.S. Census Bureau, the 2012 Supplemental Poverty Measure data provide a more comprehensive picture of poverty than the traditional measure by taking into account factors such as work expenses and medical costs that can push families into poverty. The data also provide crucial information on the effectiveness of work and income supports such as the Supplemental Nutrition Assistance Program, or SNAP (formerly known as food stamps), and the National School Lunch Program, both of which help lift families above the poverty line. Unlike the traditional poverty rate, the supplemental measure also takes geographic location into account; as a result, states with higher costs of living often see higher poverty rates than under the traditional measure. The release of this data could not be timelier for Farm Bill negotiations. They show that 49.7 million people, or 16 percent lived in poverty in 2012, which is not statistically different from the rate of 16.1 percent in 2011. The data also underscore that even as the economy has grown, the share of people living in poverty remained unchanged as the gains from economic growth failed to reach families at the bottom. Against this backdrop, SNAP played a key role in preventing even more people from falling into poverty last year, keeping approximately 5 million people above the line. In fact, SNAP was one of the most effective programs in lifting the incomes of people struggling to afford sufficient food, and the child poverty rate would have been 3 percentage points higher without it. The National School Lunch Program also played a role, keeping approximately 1.25 million people out of poverty by providing meals for low-income schoolchildren. Unfortunately, instead of debating how to cut poverty, the current question before Congress is how much to cut nutrition aid. 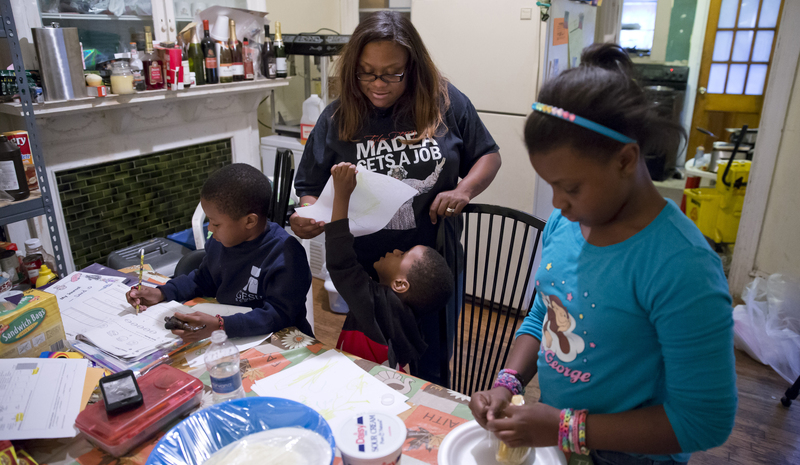 The Senate bill proposes $4 billion of cuts over 10 years by taking away a “Heat and Eat” provision that allows states to coordinate nutrition aid with home energy assistance, enhancing benefits for low-income households with high utility bills. The harsher House bill proposes cuts of nearly $40 billion over 10 years, which would kick 3.8 million people off of SNAP and keep 210,000 children from receiving free school meals in the first year alone. These proposed cuts would come on top of $11 billion in SNAP cuts over 10 years that already went into effect on November 1 as a result of the expiration of Recovery Act dollars, which translates into 21 fewer meals a month for a family of four, even before the Farm Bill is enacted. Add to the mix a year of sequestration cuts that hit programs such as Meals on Wheels, affordable housing, and Head Start, and you have a toxic policy cocktail for families who need a hand up, not a slap down. Both the House and Senate bills would eliminate the “Heat and Eat” provision that offers an enhanced nutrition benefit in some states to help households avoid the dilemma of whether to pay the heating bill or the grocery bill. And the House Farm Bill would make things substantially worse for struggling families and for our economy as well. Among other provisions, it targets adults without children who live in areas of high unemployment with stringent work requirements while ending the modest education and training dollars provided to help them find jobs. It also ends an option known as “categorical eligibility” that allows states to streamline access to nutrition assistance. All in all, it is estimated that the House bill would cost our economy 55,000 jobs in the first year of cuts alone by reducing demand for food in ways that ripple throughout the supply chain and surrounding communities. While these changes would affect families in every state, the states with the highest poverty rates under the supplemental poverty measure would be among those most adversely affected. 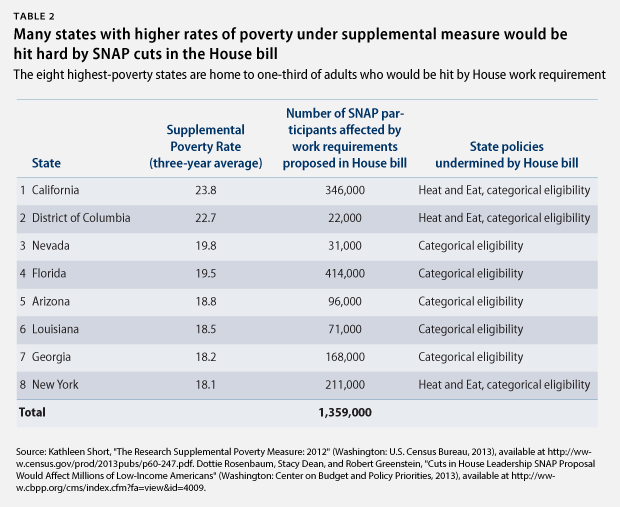 In fact, the top eight states with the highest supplemental poverty rates are home to more than one-third of the adults without children who would be subject to SNAP work requirements in the House Farm Bill without any promise of training or education to help them find jobs. The top eight states have also all chosen to enact provisions to streamline access to food aid, which the House bill would undermine. In short, the new supplemental poverty data show an economy that is not working for many people. But it also emphasizes that millions of Americans are being lifted up by effective work and income supports such as SNAP and school lunch that provide a hand up in tough times and pave a pathway to the middle class. These supports are under severe threat. As the House and Senate continue negotiations on the Farm Bill, their deliberations should be informed by these data that show the ongoing hardship across the country and the strength of effective programs such as SNAP. Instead, the question unfortunately before Congress is how much food aid to cut from families struggling against hunger. These new data should provide them with food for thought. Author’s calculation based on Dottie Rosenbaum, Stacy Dean, and Robert Greenstein, “Cuts in House Leadership SNAP Proposal Would Affect Millions of Low-Income Americans” (Washington: Center on Budget and Policy Priorities, 2013), available at http://www.cbpp.org/cms/index.cfm?fa=view&id=4009. *Update, November 6, 2013: This article has been updated to include the value of SNAP cuts over 10 years ($11 billion) as a result of the expiration of Recovery Act dollars.